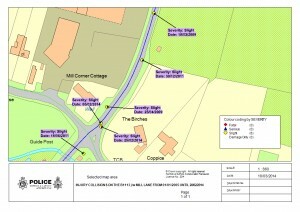 The junction at B1113/Mill lane/Top Row has been the subject of much discussion within the village over the years. This is due to the number of road accidents occurring at this location, many of which required the attendance of the Emergency Services. It has been many years since any of the accidents resulted in fatal injuries – there had been two deaths in the 1980s. However, in the last few months a spate of accidents has raised concerns. The Parish Council has been asked to explore ways in which the junction may be made safer for the the general road user and for residents who have to use it for their normal business. Reference to council minutes will see that this has been discussed many times. Usually the response from NCC Highways has been that this stretch of road does not meet the various criteria for such initiatives as reducing the speed limit, introducing additional signage, or amending the junction itself. We need to make a case for action. This will require accurate information about incidents at this junction. Corporate memory is limited because NCC cannot records an accidents unless they are specifically told about them. They will also remove such records after a few years anyway under their document retention policies. Furthermore the Police will only record an accident where they are called out to attend a scene and where an offence or an injury has occurred. This is their graphical summary from January 2005 to February 2014. So there is an incomplete record of events at this junction. On this page you will see the accidents which we are aware of having compiled it from newspaper and residents’ reports. We hope to maintain this and provide a more complete record. But, it will need parishioners to report to the Chair (with pictures!) the details of the accident. 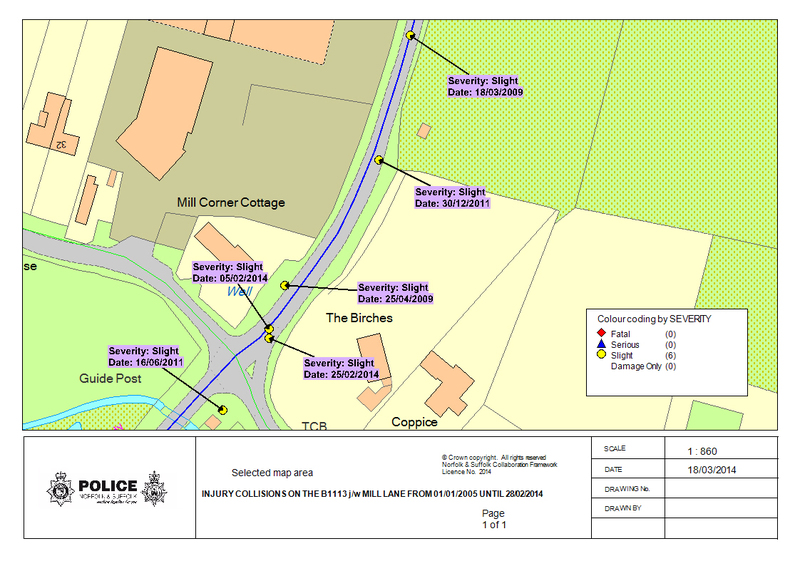 Norfolk Constabulary’s Traffic Management Officer report – the TMO visited the site and discussed with parishioners and the Chair the nature of the junction and their concerns. He made a number of observations and recommendations for NCC Highways to note.